UFM Community Learning Center is a creative educational program serving Kansas State University, Manhattan and communities across Kansas. UFM offers a variety of noncredit and credit classes for all ages and interests. • MillionTo1 Goal-Getting Course for K-State faculty, staff and students. Those who are interested in learning more about setting goals, creating action plans and building a support network can find more information and enroll online. These classes begin the week of Jan. 22 and run for either four or six weeks. Please email any questions to Carmen Schober at carmenschober@k-state.edu. • Ana Franklin, yoga instructor for the university, has partnered with Argentine tango teachers Kirill and Sophia Minieav, of Tango Matiz in Kansas City and UFM to offer a beginner tango class. The beginner class and practice will be from 7-10 p.m. Friday, Jan. 27, at Ahearn Gymnasium with a follow-up tango party from 2:30-4:30 p.m. Saturday, Jan. 28. Please register as the venue has a limited capacity. Both events are free. Learn more or register by emailing yogaconnection@gmail.com. Also find Tango Dancers of Manhattan, Kansas on Facebook for more details. 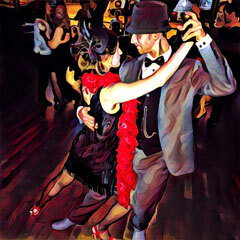 Additional tango class dates and enrollment are available online.